After looking through Home for the Holidays, I knew these cookies would be at the top of my list to make. They're small and remind me of a cookie that I like but don't buy often because I can easily eat the whole package. Cakey chocolate sandwiches are exactly what their name implies. Two soft cocoa cookies sandwich a simple vanilla icing which makes for a tasty treat. The cookies are soft and need to completely cool before filling. They're a bit fragile so if your icing is stiff, you can add tiny amounts of cream to soften it up otherwise your cookie will break. I found these cookies tasted better the next day after the icing and cookies had time to mingle together. They don't taste anything like a purchased cookie and if you put a plate of these out for kids they'll disappear. As 2008 winds down, I want to wish you all a Happy New Year! Thanks for reading and I'll see you on the other side! I hope all of you are having a great holiday season! I know I am because my oven is finally fixed! Yahoo! So soon I will be back to baking but until then, I share with you some fudge that I made recently. It's no-bake and super easy. 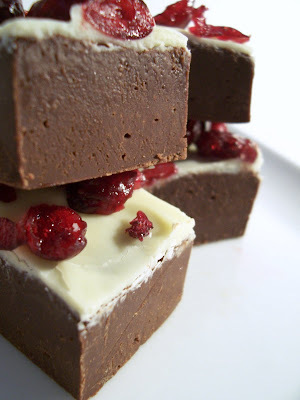 If you've never attempted fudge, try it out...you will not be disappointed with the results. Use the best chocolate as possible so your final product is smooth and creamy. You can omit the cranberry topping and use one of the the variations in the recipe. What do you make when you're still waiting for your oven to be repaired and everyone around you wants something sweet? You make Haystacks is what you do. No doubt you've heard about these cookies (which have been around for years) and know that they come in a multitude of variations. Most recipes include the dry chow mein noodles but I opted for corn flakes because I think they look neater. They're really a kid-friendly no-bake cookie. Melt, stir, scoop, and chill. They were a little messy though, and more than once I had a stack fall apart on me. I pretty much left them in the shape of the measuring scoop I used because I was afraid to touch them - they're fragile before they firm up. All in all, haystacks are an impressive, crunchy and easy treat to make and, as a bonus, the recipe makes a whole bunch. Make them smaller if you want more cookies and personalize them as you like. Topping with red, green and white sprinkles would definitely look festive on any cookie tray.